I must confess, I’ve been checking my mailbox daily for this little package to arrive. It will allow me to keep track of inventory and sell my wares over the two big Philomath Open Studio Tour weekends. I’ve already stocked my online shop with all the goodies now residing at Judi’s place. Tuesday afternoon is the first round of the pre-tour showing. Since the artists are stuck in their studios over the weekend and we all want to see what everyone else is doing, a pre-tour extravaganza was created years ago. The schedule is tight and the group (36 artists plus spouses/partners) drive around to each studio and spend a whopping 15-20 min total at each location ( 15 studios split between two nights). It feels like musical chairs, but no one is left out. Our studio is on Tuesday’s schedule. I still need to take a few items over, price stickers, electrical strips for lights, furniture to boost up lamp height, adjust lights…. probably a few other things I’ve misplaced in my brain! Today I’m working through my to do list. The Square account is connected and operational on my smartphone! Dogs are miffed about a lack of love. No major dog walks since last week. Dave left for a week of work in the Everglades. It’s certainly a different venue for him: field work. No hotel, all camping in hot muggy weather with bugs and lots of rain scheduled. Mmmmm, I’m kind of liking where I’m sitting right now. Time for a nice warm cuppa tea! I’ll try to snap a few photos if I can. Dave took my camera to Florida. Smartphone to the rescue! That looks like a very useful device! 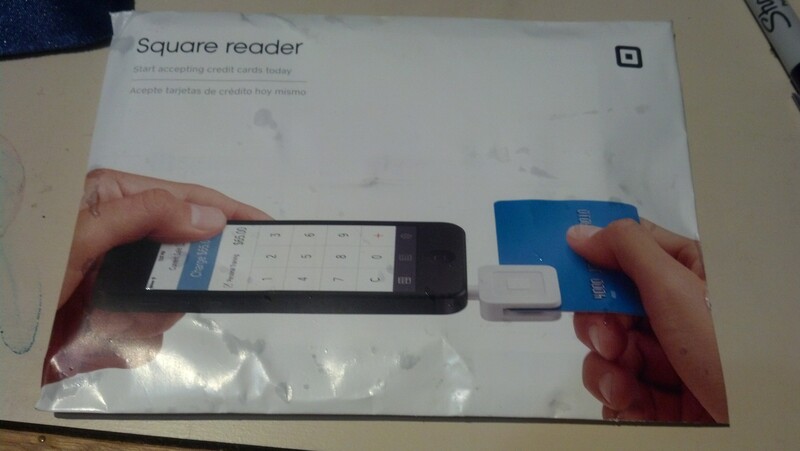 It’s a credit card reader that plugs into a smartphone or tablet device. Quick, easy, and mobile! I even use it to keep track of inventory levels. That looks like an interesting gimo.